Seamus Heaney tops and tails Seeing Things with his own versions of passages from classical masterpieces, starting with ‘The Golden Bough’ borrowed from the pre-Christian classical mythology of Virgil and ending with a Dante passage from the Christian era. In both cases the narrative is not Heaney’s as such but he employs all his compositional skills to produce a polished translation. 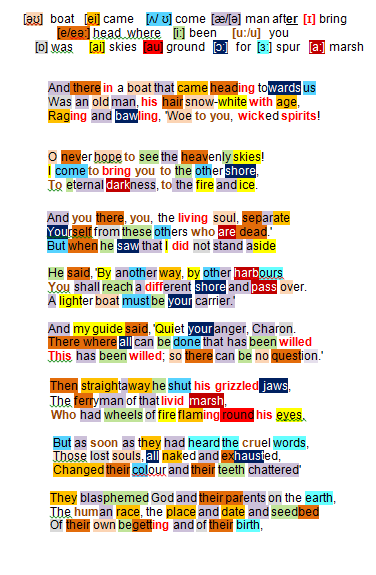 From the shore where Dante, Virgil and a group of damned souls await transport across to hell a boat approaches: rowed by an aggressive (Raging and bawling) old man (hair snow-white with age), threatening perpetual desolation (‘Woe to you, wicked spirits’), providing a one-way-ticket to endless suffering (eternal darkness … fire and ice). Used to being obeyed Charon seeks to reject Dante, the living soul, who holds a return-ticket, from the queue. Dante stands his ground; Virgil intervenes: the decision to cross was made by a higher authority (This has been willed; so there can be no question). The terrifying boatman (wheels of fire flaming round his eyes) climbs down (straightaway he shut his grizzled jaws). The brutishness of his manner, however, has had a dire effect on the lost souls now without dignity (all naked and exhausted) and sick with fear (Changed their colour and their teeth chattered). No one is spared their curses: neither the Creator (blasphemed God); nor their parents on the earth; nor Man in general (human race); nor the sexual act that produced them and their genetic inheritance (place and date and seedbed Of their own begetting). Painfully (bitterly weeping) they bow to pressure and reconcile themselves to the inevitable accursed shores in the grudging acknowledgement that theirs is the fate of every man who does not fear his God. Dante watches the ultimate humiliation at the hand of the devilish ferryman with eyes … like hot coals fanned; how he signals (beckons), bullies (herds … together) or chastises (beats with his oar). Dante reflects on God’s Justice (the expulsion of Adam and Eve from the Garden of Eden) and why, as a result of Adam’s disregard for His instructions, and via him man’s innate inability to discriminate between right and wrong, sinners await transfer to hell. 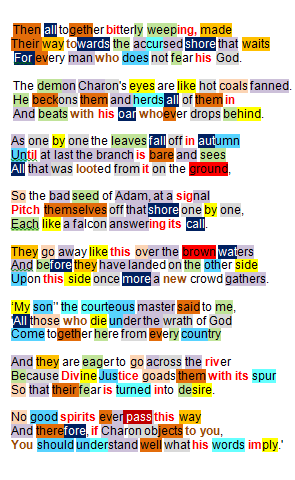 Trees were predominant symbols in Eden and Dante’s simile may well derive from there: due to Adam sin is as predictable as falling leaves in autumn, applying ultimately to each and every one (until the branch is bare), God’s booty (looted) littering the floor beneath. As a result the sinful (bad seed of Adam) submit themselves instinctively (like a falcon answering its call) to the order to proceed to hell (Pitch themselves off that shore). Scarcely have they reached hell than Dante notes the arrival of a new batch where the first queue waited. Virgil (the courteous master) explains both Charon’s reactions to Dante and, initially, the constant flow of sinners (who die under the wrath of God): the latter are universal, impelled by the force (goads … spur) of Divine Justice that transforms their anger into enthusiasm (eager … fear ( ) turned into desire); those awaiting the ferryboat are all bad (no good spirits); Charon sensed that Dante was a good man, hence his objection.